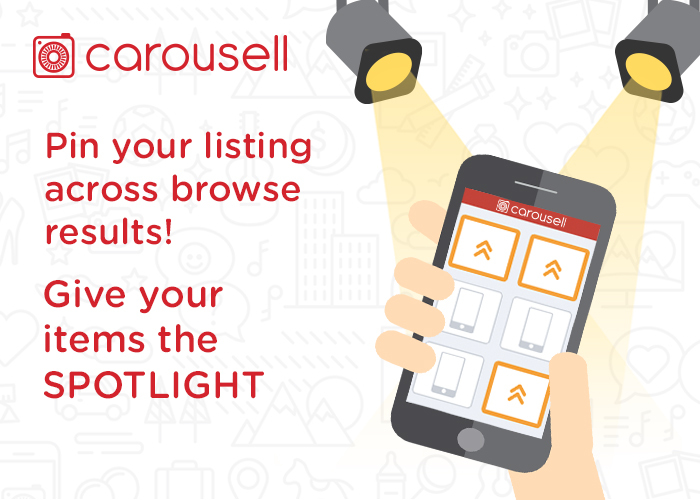 “How to promote listing on Carousell” is a guide that shows you how to get more views for the used items you sell in our online marketplace. Imagine this; it’s opening day for your fancy dessert place. You expected a crowd of 1000 strong, but only ten showed up. You swore you settled everything properly, from beautiful decor to an enticing menu. If your guess was your failure to publicise your event to spread the word, ring-a-ding-ding you’re correct! As they say, you can come up with the best thing in the world, but if you don’t shout about it, nobody’s going to know. It’s the same on Carousell. You can have the most beautiful product photo, a compelling product description or the best price in the second-hand market, but you might fail to sell your item if you don’t make any effort to promote them. 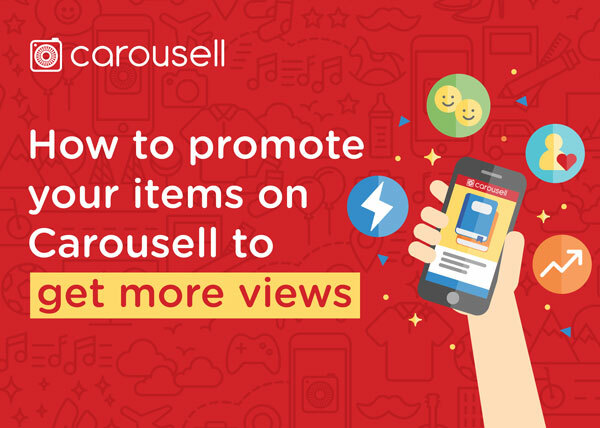 In this guide, I’ll show you exactly how to make a successful sale on Carousell by promoting your items to get more views. All four options give your second-hand goods you’re selling way more exposure. I’ll show you how to be a successful seller on Carousell starting with the first option! Did you know that you can share your listings on Social Media and other messaging apps just by a tap of your finger? See the red highlighted box? Just tap it and choose your preferred one to promote what you’re selling! Simple. However, if you have a ton of friends and you already know the right person that’s interested in what you’re selling, I’d recommend sharing through messaging apps like Telegram or WhatsApp. That way, you don’t have to waste time waiting for an interested buyer to chance upon your promotion. Besides, it’s free. So, why are you holding back? Get sharing! Pro tip: If you have the time, share your listing on all your social media accounts for a significant increase in exposure. Be ready with an amusing caption to go along with it. Now, you know how to promote your listings on Carousell via social media and messaging apps. On to the next tip! I know, this tip seems quite similar to promoting your listings on your social media feed. Let me explain why it’s different. Facebook groups and online forums usually contain members that have a shared passion for a particular niche. So, if your used item belongs there, share it with them. You’ll have better luck selling by sharing it with an interested party. Also, if you have a ton of other similar second-hand things for sale on Carousell, I’d advise sharing your whole profile to save time. Just let the group members know what you’re selling. So, that’s how different sharing on your social media feed and social media groups can be. Let’s get started on the third tip! Well, Facebook isn’t the only cool kid on the block with groups. Carousell has them too. Carousell started “Groups” to encourage our users to find people with common interests. We wanted to provide an environment for you to join groups you like and buy and sell within that community. 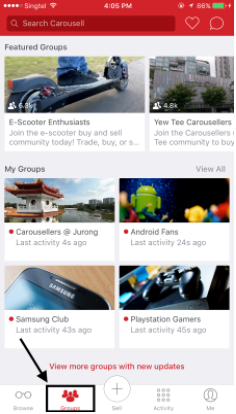 First, find out which Carousell groups interests you the most (e.g. Adidas or Yoga). Then, join these exclusive communities and list up your items to increase your chances of getting more views and selling them. There are even groups based on where you stay. Convenient huh? 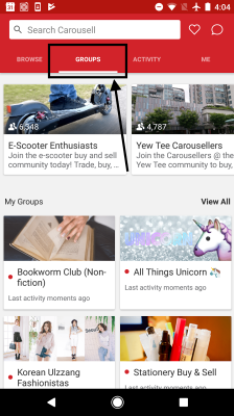 For Android users, you can find the Groups tab just below the Search bar. 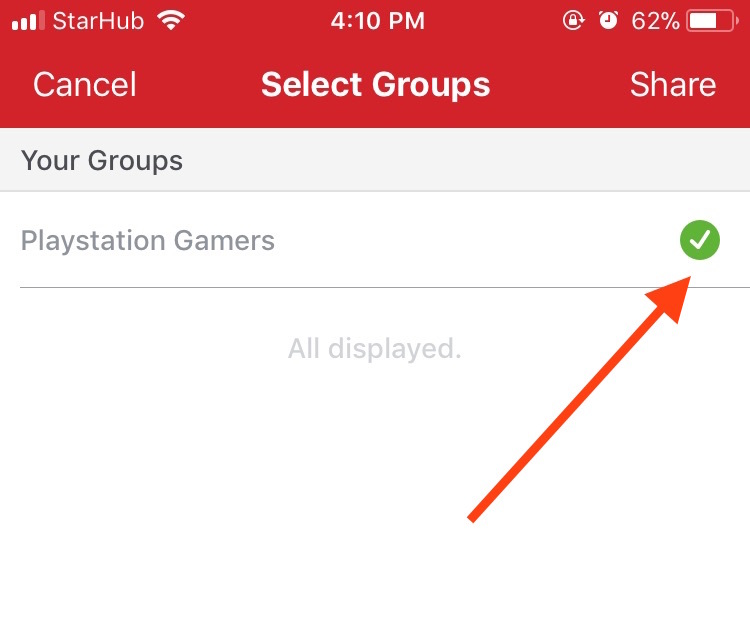 I’d recommend making it quick by using the search bar to get to the Carousell group you want to join. Once you’re ready to share your used item with the Carousell group you joined, go to your listing page. Select the right group and hit “Share”! It’s as simple as that. Pro tip: You can also search for a Group by entering keywords. Keywords you can try include brands, locations, celebrity names, hobbies, trends and so on. You’re almost there, on to the last tip on promoting your items on Carousell! Carousell Bumps is a feature you can use to give your item a boost. It brings your listing to the top of the marketplace at a given time. Long story short, the massive benefit of getting a Bump is that it gets you 2x more views than usual. Tempting? I reckon it is, especially if you’re in a hurry to sell. 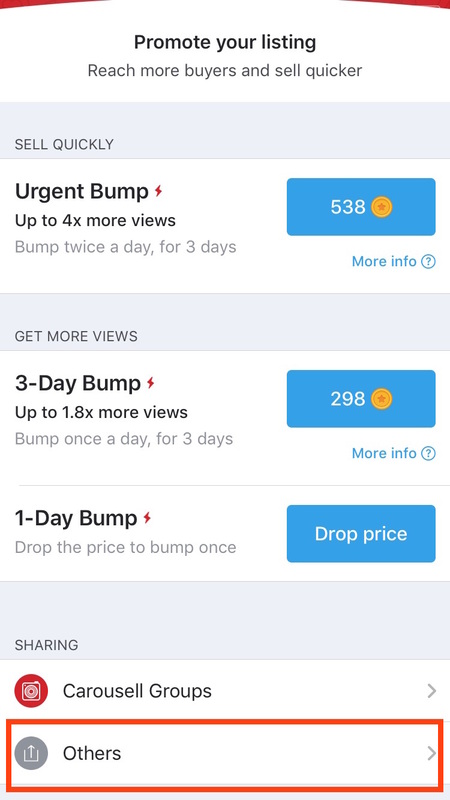 Don’t jump the gun just yet, check out this guide for an in-depth look at how Carousell Bumps work and how much it costs. As a bonus to you for getting this far, here’s an extra tip on promoting your items on Carousell! This might sound like a “duh” to you but believe me, a lot of sellers forget to share their listings with their friends. People are naturally friends with others that share common interests, hobbies, even tastes. With that said, don’t you think your friends will be the best “promoter” of the second-hand things you’re selling? Personally, I would ask a favour from my friends to help spread the word about the thing I’m selling on Carousell. Think about it this way; you have 50 friends, and your friend has another 50 you don’t know. That’s possibly double the exposure. All it takes is a good friend that’s willing to share. You never know, they might even be interested enough to buy off your used items from you! Thanks for reading it until the end! Now, you have 4-5 different ways of promoting your listings on Carousell. If you ask me, I’ll recommend using every trick of the trade we shared if you want to make a successful sale fast. Besides, nothing to lose right? Putting a little extra work from the beginning will save you a ton of time later. Feel free to leave your comments below if you need any extra help. If you’ve any friends selling on Carousell too, do them a solid by sharing this guide with them! Next articleWallich Residence expert review: Should you buy and invest in the condo? HI After the recent upgrade, I am no longer able to Edit pictures on my carousell app on the iphone. :((( Could you please advise or assist please? Oh no, I’m sorry that happened! However, for any support related issues, could you direct it to support@carousell.com? Hope this helps!